Press Release: Celebrate Earth Day by Riding PSTA! Why: To provide transportation options, cut demand for oil and to protect the environment. First, you’ll want to plan your trip. 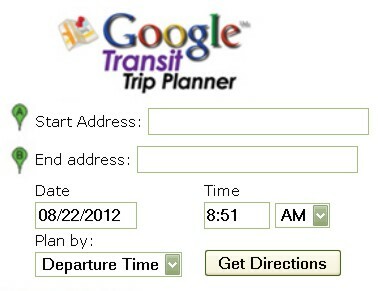 For that you can use the Google Trip planner located on PSTA’s home page at www.psta.net or you can simply call the PSTA InfoLine at (727) 540-1900* to speak with a live Customer Service Representative. They’ll be happy to help you plan your trip and answer any questions you may have, such as discount fare information. It only costs $2.00 to ride one way (full fare) or $4.50 to ride all day, plus you can buy your daily bus pass right on the bus, though exact change is required. Then, when you’re ready to travel, you can call, text, logon or use a smartphone to check exactly when your bus will arrive at your stop with PSTA’s new Real Time Bus Information System. Current riders will tell you that it’s easier than you think to start enjoying the luxury of letting someone else navigate the traffic tangle that comes with living in Florida’s most densely populated county. Still not sure? Then, check out PSTA’s “how to” videos on the agency’s “How to Ride” page: www.psta.net/howtoride.php. There you’ll find videos showing you how to pay your fare, how to ride if you use a wheelchair or mobility aid, how to use the Express Routes to Tampa and how to bring your bicycle with you when you ride. Suncoast Beach Trolley in front of the Hurricane Restaurant. Circa 2001. If you have the day-off for Earth Day, why not try two of PSTA’s most popular routes serving Pinellas County’s award winning beaches? 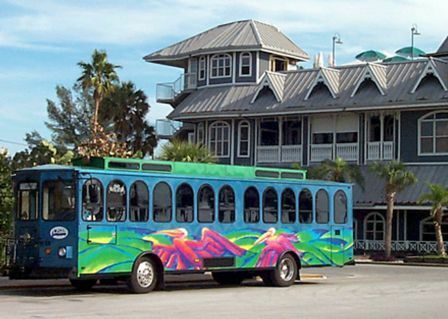 You can find a preview video and schedule for the Central Avenue Trolley (a one-seat ride from the Pier to Pass-a-Grille) on the agency’s Central Avenue Trolley webpage: http://www.psta.net/CAT.php. Plus, there’s a similar video and timetable for the Suncoast Beach Trolley℠ on the Suncoast Beach Trolley℠ page at http://www.psta.net/beachtrolley.php. * The PSTA InfoLine is open Monday through Friday from 6 AM to 8 PM, Saturday from 7 AM to 8 PM, Sundays and Holidays from 8 AM to 4:30 P.M.
It’s Official: Real Time is a Hit! For those of you already using it, this news will come as no surprise. We’ve been watching the usage level go higher and higher over the past year since we implemented our state-of-the-art Real Time Bus Information system, and I’m pleased to report that it’s a hit! So, thank you! Thanks for helping us test the system before we launched. Thanks for using the system every day. Thanks for using technology to make your transit experience more enjoyable. And, thank you for riding! We appreciate you, and your support! Real Time is Really Here! Every bus stop in PSTA’s system has a unique bus stop number. To interact with the Real Time system, you’ll need to know that bus stop number. It’s located on a sticker at the bottom of the Real Time sign installed at your bus stop (sign installation is ongoing – we have 5000+ stops, so it’ll take us a little while to get them all put up). You can also find out your stop number by looking it up on the RidePSTA.net website (see Visit the Website section below). Once you find your bus stop number, keep a list of favorite stops and their stop numbers handy. Using a technology called “Interactive Voice Response” or IVR, our Real Time system is able to give you automated departure times by phone. 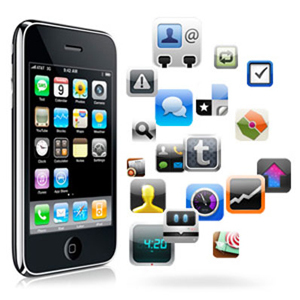 Just call the InfoLine at (727) 540-1900, press 1 for Real Time, and choose your language. You can use your phone’s keypad or just speak your choices out loud. Enter your stop number and the system will tell you when the next few buses will serve your stop during the next 30 minutes. NOTE: We are still implementing the IVR portion of Real Time Bus Info, so sometimes the system might tell you “Real Time info is not available.” Please stick with us while we iron out the wrinkles in this one piece of the larger Real Time pie! If you’re at a bus stop and have a Smart Phone, you can use a barcode scanner app to scan the QR code on the Real Time sign, or just type in www.RidePSTA.net from your browser. 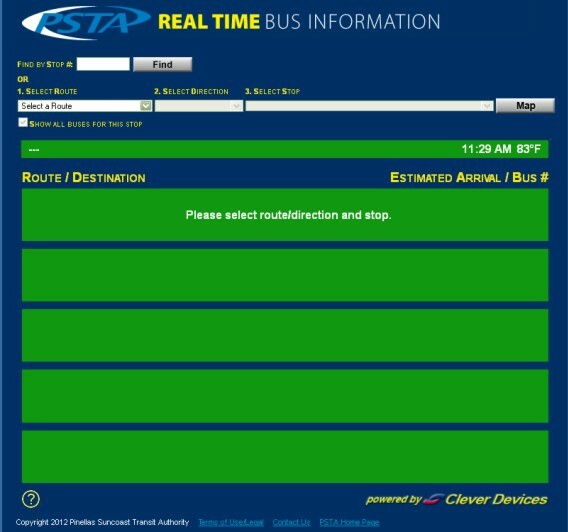 Type in your stop number and click “Find.” The system will show you when the next several buses will serve that stop. If you don’t know your stop number, choose your route, direction, and stop description in the drop down boxes. The system will show you the next several buses that will serve the stop. Searching for your stop number? After you use the drop down boxes to locate the stop the system will fill in the bus stop number for you. While you’re on RidePSTA.net you can also create an account and set up alerts. Each alert you set up will send you next bus information based upon the specific criteria you input. For example, if you want to see the departure times for the stop outside your work every weekday at 4:00 p.m., the system will automatically send it every day at 4:00 p.m. Just select your stop, the time you want the alert to arrive, and check if you want it to come via email and/or text message (your phone’s standard text and data charges may apply). You can go in any time to add, delete, or edit your alerts. You can also use your cell phone to get instant bus departure info. 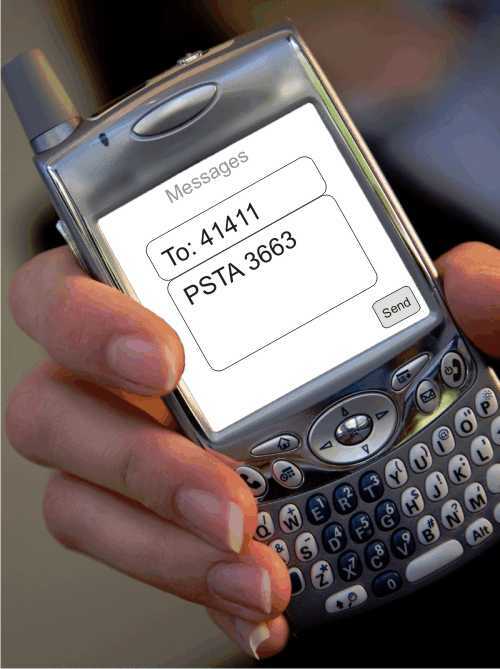 Type 41411 in the “to” box of a new text message, then put in PSTA, a space, and your stop number (like this: PSTA 3663). Send the text message and you’ll get one back almost instantly with the next buses serving that stop (your phone’s standard text and data charges may apply). Reply with “R” to get a new text with updated info for that stop. Great if you use the same few stops every day! Many of PSTA’s busiest transfer locations have electronic signs showing upcoming departure info. You’ll find them at Grand Central Station, Williams Park, Park Street Terminal, Gateway Mall, Tyrone Square Mall, Shoppes at Park Place, and Westfield Countryside Mall. Usually they’ll tell you when the next few buses are due at the transfer center, though the signs at Grand Central are platform specific. 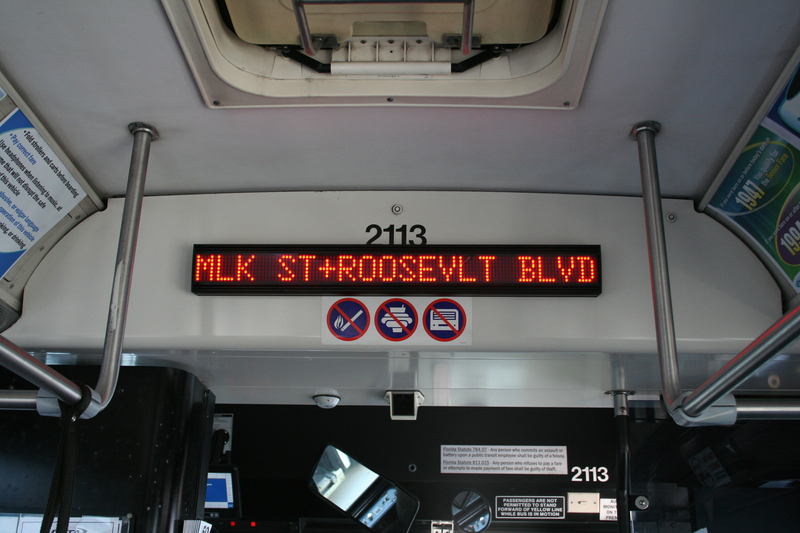 Once you’re on board, look for new electronic signs at the front of the bus that will announce upcoming intersections. The system will also make audio announcements with the same information. PSTA is very excited to be bringing this state-of-the-art technology to our transit system. We know it will be very helpful to our passengers and encourage you to give it a try. But, we’re also still here for you if you prefer to get your bus information the old fashioned way: our professional Customer Service Representatives will answer the InfoLine when you call and press O! However you choose to get your information, we’re glad to have you aboard! Hey Developers, we have open data! As part of PSTA’s exciting new Real Time Bus Information system, we’ve decided to make our data “open.” That means software and app developers can access our Real Time data and use it in apps that will help others get the information they need or want about PSTA bus service. We won’t tell anyone what to develop or how to do it, but we do have a whole section of our website dedicated to Developers which includes some helpful tips. The information provided through data feeds includes static schedule and service data using an open standard, and APIs that can get you up-to-the-minute information from RidePSTA.net (PSTA Real Time Bus Information). We know there’s a demand for this type of app, and we’re really hoping that there are millions of developers out there who will want to create some for PSTA (yes, “millions of developers” is unrealistic, but surely there are a few, right?!). So, hop to it! We’re excited to see what you come up with! Our Real Time Bus Info System is almost finished! Please read “It’s time to get real” if you aren’t familiar with this exciting new project. Thank you so much to all of you who have tried out our website while it has been in test mode. We’ve gotten some great feedback and really appreciate your input. 1. The special equipment for the Real Time Bus Info system has now been installed on all of the regular transit buses and trolleys that serve our Pinellas routes. The coach-style buses that run Routes 100X and 300X are still being wired up and we hope they’ll be done shortly. 2. The email and text alerts are working! Please sign yourself up for some alerts and try it out. 3. Our project vendor has assured us that we’ll be getting a software update at the end of the month that will add the ability for you to type in a specific Bus Stop #. 4. Once the Bus Stop # feature is active we intend to start installing the Real Time Bus Info signs below our new bus stop signs. The signs will explain all the ways to access Real Time Info, including text messaging (you’ll send a text with PSTA followed by your bus stop number to a special phone number and the system will text you back with a list of the next few buses serving that stop!). We love feedback, so please share your thoughts, comments, kudos, whatever, by commenting on this post or by sending email to ride@psta.net. p.s. In case you don’t have the online site bookmarked yet, click here to try it out!